How quickly the end of academic year has arrived. The last month has been a non-stop whirlwind of preparation and running of the show, last minute classes and tutors setting up assignments for the summer. I really need the summer break! We will have more work to do over (the very short) summer break than I was expecting – but I really need some time to do some proper thinking, and more importantly have a rest! This entry was posted in 03.6 Unit 1 reflection on 26 July,2015 by antalbot. I have recently bought a new calligraphy pen, the oddly named automatic pen, and the impending end of term has inspired me to take some out time to play! This entry was posted in 02 Calligraphy and tagged calligraphy on 21 July,2015 by antalbot. The biggest piece of learning I will take away, is how you cannot overestimate how much work is involved in setting up a show. We started preparation way too late, but no-one had any idea what was required – and we were all surprised how much we were required actually sort out by ourselves. We got there in the end of course, but there were a few too many things being done (and work being finished!) just hours before the show opened. I was impressed and surprised by how many people came to the private view, it was actually quite an event! I realise the vast proportion of visitors seemed more interested in drinking the beer than looking at the work, but I suppose that’s part of what a PV is about. There were some genuinely interested visitors as well though. Feedback wise, I had a number of people ask about what the work meant, particularly the Starfield piece, and quite a few people commented on how they liked the map basket. I even had a lovely discussion with Stella Harding (basketmaker), who took a few photos for her Morley students, and great comments from an unidentified member of Camberwell teaching staff – that’s the sort of feedback which motivates you to keep going. So far, I have had three parents, one husband and a next-door neighbour come to visit me. So great to get so much support. Oh and nearly all of my business cards are gone already! I have also taken the chance to quiz some of the second years before they disappear into the mist. One of my friends on the MA Book Arts course (with a mesmerising installation in the show), had some of the most poignant wisdom. Like me, she spent her EFT 1 year wandering though a range of very different experiments trying different concepts and different techniques, and ending up confused and overwhelmed with ideas. Her final success she believes, came from entering the second year with a new sense of purpose. This entry was posted in 03.2 Shows, 03.6 Unit 1 reflection and tagged Camberwell MA Show on 20 July,2015 by antalbot. We are about halfway through the show as I write this, while sat in our gallery space awaiting this morning’s opening time. In the end, there were a few iterations of my display before settling on the final collection of pieces. At first, Maiko suggested I was in a no-man’s land: not resolved enough pieces for them to stand alone, but not enough exposure of process to show a proper work in progress. I’m not sure I completely agreed with her, but I understood why she wanted to show more of our processes – and to make a clear distinction between our ‘work in progress’ show and the MA final show – all shiny and finished – downstairs. I also dropped a quick hand with some calligraphy for one of my fellow students in need! This entry was posted in 02 Calligraphy, 03.2 Shows and tagged basketry, Camberwell MA Show on 20 July,2015 by antalbot. 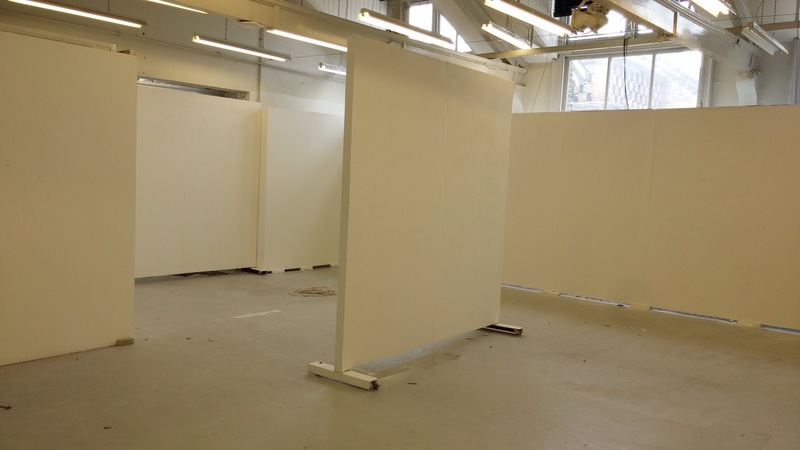 The day for the interim show opening draws nearer, and it’s all a bit manic in the show space as last minute preparations continue. I think I am pretty much done now, having spent most of the last two weeks working on two new experiments for the show. I have decided to go with three pieces. My rust dyeing and drawing experiment. I think this nicely captures the ideas of microcosm-macrocosm and using local materials with non-local symbolism. The first of my basketry experiments, using steel cables to echo the importance of iron to human life, both on a micro-scale (human society itself) and a macro-scale (the core of the earth and the core of the dying stars). I like the way the map is out-of-date – showing you a place which does not physically exist, only now an impression of place shaped by memory and experience. The twining was a lot of fun, but making the map yarn took a lot of time. I have the technique sorted now at least!! A follow-on from the first twined piece, making more of the connection between the steel and the earth’s magnetic field. The form of the basket was inspired by a compass rose, where the human impression of place, signified here through a twined yarn made of place names, is what we overlay onto the physical world in order for us to understand it. How do we understand our sense of place in the world beyond the constraints of community and culture? These works explore different aspects of the interaction of local and non-local, the physical and the meta-physical; I use steel wires as a physical manifestation of a material critical in human, planetary and stellar lifecycles. Upon this core, I am experimenting with different weaving and drawing techniques. Private View this Thursday night (16 July) at 6pm, Camberwell College of Arts!! 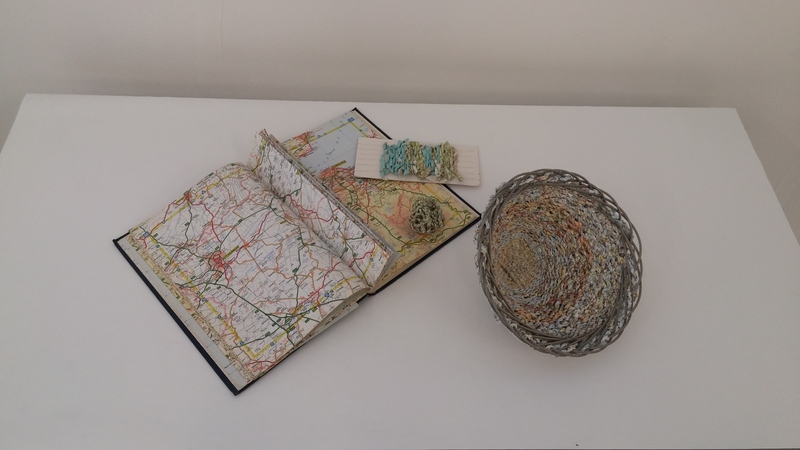 This entry was posted in 03.2 Shows, 03.5 Unit 1 experiments and tagged Alternative Maps, basketry, Camberwell MA Show on 13 July,2015 by antalbot. This entry was posted in 03.2 Shows on 6 July,2015 by antalbot. Meaning: looking at a sense of place beyond borders, beyond cultures. So! I have started a new set of experiments. Going back to some of my experiments from January, I am returning to the idea of basketry – and weaving more generally, after the delight I found in the frame weaving we did with Alice Fox last week. I am also returning to the idea of hand making paper yarn using old out of date maps (which I first tried in March and promptly abandoned!). I like the symbology of using an old map as a physical record of a point in space and time which no longer exists – as our memory of place also does. We take our interaction with places and twist and warp them through our own mental filters, creating our own personal map of the world. A few obvious things to change to make this better (including getting rid of the commercial paper yarn and making my own finer map yarn), so test 2 is now underway. Although there is an obvious connection between map and place, this seems like a good time to explore fully the extent of meaning about working with maps. Cartographic language is intrinsically linked with identity and the spaces we inhabit. Every map is framed within our representation of the world, defined by ourselves, our communities, our nations, our planet and beyond. Mapping allows us to locate ourselves in the world both physically and psychologically, the map of ‘imagined’ just as potent as the map of the ‘real’. Maps can be a simple scientific tool leading to familiar or unknown destinations, or to home or displacement, be turned upside down and inside out, connect to an interior mind or an exterior world. Every map however is a projection, a representation. Maps produce new realities as much as they document existing ones. Projections are constructed, configured and underpinned by various assumptions about people – about place. A map, like a place is seen from the inside, with all of the inner workings of its visual field laid bare. But how can you know the full extend of any territory without surveying the entire space from beyond its borders? How can we know the size of the universe without stepping outside it? “Maps are the everyday metaphors that speak to the fragile and transitory state of our lives and our surroundings. Rivers shift their course, glaciers melt, volcanoes erupt, boundaries change both physically and politically. The only true constant is change. Second is one of my essay references Chris Drury, who uses maps as a way of making comparisons between places and as a way of exploring a place through which he has walked in a more reflective way. He uses maps in various ways, including cutting the maps of two places into strips and weaving them together to give both places a common context. This entry was posted in 03.5 Unit 1 experiments, 04 Research, 04.1 Artists references and tagged Alternative Maps, chris drury, mapping, shannon rankin on 3 July,2015 by antalbot.